In my book The Counter- Terrorism Puzzle: A Guide for Decision Makers, published a decade ago, I offered the reader a new doctrine for fighting terrorism – on defense/security, intelligence, legislation and moral- psychological issues. The 10th chapter of the book deals with dilemmas arising during international cooperation in the field of counterterrorism and emphasizes the need for upgrading international cooperation to a level of collaborative combat, so to speak. “It would seem that the nations’ balance of interests will change only when terrorism passes a certain level of damage and the threat increases significantly. In other words, the nations of the world need for ‘things to get worse’ before they take the initiative against international terrorism and against the countries involved in terrorism. Perhaps the September 11 attacks in the United States served as the watershed line in international terrorism. But as of this writing, it would appear that, except for the American leadership, and perhaps the British as well, the world has yet to awaken from its complacency. Are the dangers presented by Islamic State to European and global peace, and are the “Black Friday in Paris” attacks, signaling the beginning of the change? Only time will tell. Europe and the free world must enact a fundamental reform in their policies of coping with terrorism. The change must be multidimensional. It must begin with a perceptual change – a deep familiarity with the enemy and an understanding of his rationale. Next, there should be a legislative change that will provide security bodies with additional prerogatives in their struggle against terrorists, while preserving the required balance between the effectiveness of the war on terrorism and the country’s liberal/democratic values. Also required is a change in doctrine that includes revoking the Schengen Agreement, which asserts freedom of movement between European countries; developing advanced methods and means of closing borders and ensuring effective border control at the crossing points. Another doctrine change would mandate proactive actions to thwart terrorism, and a transition from defense to initiation and attack. Europe must make a change in its immigration policies in order to limit the number of immigrants, to enforce a strict screening process, and to determine the conditions an immigrant must meet before receiving resident or civilian status – including a ban on incitement and a commitment to civil liberties and equality for women. Europe must incorporate ethical changes while reviewing the multicultural principle and developing integration mechanisms that will bring the immigrant population to a state of assimilation and prevent social isolation. And above all, European countries and the free world must understand that effectively coping with international terrorism requires making the transition from international cooperation to a joint counterterrorism campaign. The first effort to be made within the overall effort to formulate a common international policy for counterterrorism is to create a normative common denominator, that is to say, an agreed definition of the phenomenon of terrorism. The paradox is that despite the scope of local and international terrorism, there is still no international consensus on one definition for the phenomenon of terrorism. This definition differentiates between the political goals that motivate terrorist campaigns and the method of implementation – deliberate attacks against civilians. Unlike the widespread cliché, “One man’s terrorist is another man’s freedom fighter,” the suggested definition determines that there is no political, ideological, religious, or other goal that can justify engaging in deliberate acts of terrorism against civilians. 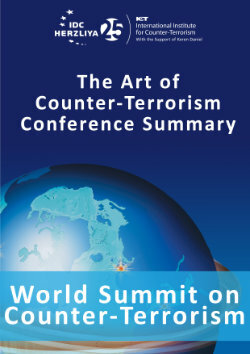 Thus, this definition makes it possible to reach an international consensus regarding the identities of terrorist organizations and to formulate the necessary international agreements for fighting terrorism, agreements that will obligate the countries to take action against the terrorist organizations’ infrastructures that were set up within their territories; agreements that will prevent incitement of terrorism and identification with terrorists; agreements that will outlaw activities of organizations supporting terrorism in the guise of humanitarian, religious, or educational activities; agreements that will regularize the rights of countries to engage in actions aimed at thwarting terrorism in order to defend its citizens, and also stating when proactive measures must be taken in a third country. A well-developed system of international agreements based on an identical definition of terrorism will provide a broad platform for international cooperation in numerous and various fields of counterterrorism. The global and local terrorism threats obligate, as said above, a transition to a whole different level of international cooperation in every aspect of coping with terrorism, and particularly in the intelligence field, in the field of operational training, and in the technological field. In the intelligence field, conflicting political interests, ego factors (personal and organizational), objective concerns regarding exposure of intelligence sources, and the dangers of collective misconceptions must be overcome. In the operational training field, the nations of the enlightened world must accept the aid of the operational experience of other countries in terms of their offensive, defensive, security- related, punitive, and legislative actions. They must also take advantage of the operational experience in rescue and recovery at terrorist attack sites, mobilizing emergency services, command, control, communication, and computers, synchronization between rescue, security, and intelligence bodies, as well as medical treatment of terrorist victims and public resilience. The practical knowledge and experience will be transmitted via joint guidance and training activities. In the technological field, all efforts should be focused on developing necessary methods for locating and neutralizing terrorists in general and suicide attackers in particular; developing intelligence methods such as audio surveillance; control and command systems; methods for locating and neutralizing explosives, and chemical and biological weapons; and systems for tracing and preventing cyber terrorism. Sharing the states’ practical technological experience in all of these areas will improve technological products, decrease their costs and shorten development time. The transition from international cooperation to a joint counterterrorism campaign is not about a purely semantic change but, rather, includes a different understanding of the nature of the struggle and the manner of required international coping. The transition to a joint international campaign of course does not contradict the need for stronger cooperation as described above, but at the same time it requires the establishment of a joint action framework for a more efficient international struggle, and that applies to almost every area and stage of counterterrorism. An international intelligence clearing house must be set up so that information and warnings about threats can be released and transmitted in real time, including information about terrorist movements, intentions, capabilities and methods of action. This information will be available to a coalition of nations combating terrorism which will include all of the countries committed to an uncompromising war on international terrorism, and will be used jointly by those countries to thwart attacks. Beyond that, a joint framework for collecting Open Source Intelligence (OSINT) must be established, to execute intensive surveillance and to also sometimes intervene in the jihadist discourses. The terrorist organizations today are very active in the Internet arena, and use Internet sites and social networks for incitement, radicalization, recruiting fighters and raising money, training terrorists, transmitting operational instructions, and more. The extent of their exposure in this activity is very high, and many countries engage in continuous surveillance of jihadist discourse on the social media sites. The information gathered by the international OSINT unit will be transmitted to the countries participating in the global and local war on terrorism. Joint international counterterrorism units must be set up, which can on short notice serve countries attacked by terrorists, in order to carry out tasks to thwart terrorism – capturing terrorists, taking over buildings and public transportation, rescuing hostages, and so forth. At the same time, it is necessary to establish an international negotiation unit for negotiating with terrorists in hostage barricade situations and kidnappings. Members of this unit must be thoroughly familiar with the phenomenon of radical jihadist terrorism, including the culture, language, religious considerations, decision-making processes, and the terrorists’ rational and cost-benefit calculations. This unit should be accessible to all of the countries facing the threat of terrorist blackmail and extortion made by radical-Islamic terrorist entities. International security units must be established to help countries suffering from ongoing terrorist threats, and also in order to present international solidarity and decisiveness in the war on terrorism. These units should be set up ad hoc in sensitive locations within the countries that request such assistance. The units should be equipped with the most sophisticated technological tools, and when spread across the territory of the countries under attack should help to professionalize the security and prevention system in those countries, so that after a certain period of time the local units will be able to replace the international ones. An international terrorism crime court for terrorist crimes (ITCC) must be established. This court will fill the present lacuna in the International Criminal Court in The Hague, with everything applying to putting terrorists on trial. The ITCC will therefore focus only on cases of terrorists, and will operate according to the authorized definition of terrorism and international conventions and agreements reached on the basis of that definition. The ITCC will also offer recommendations to international organizations for developing new international agreements, and will advance internal legislature in the different countries. The terrorism phenomenon is a multidisciplinary problem. Terrorism is relevant to almost every academic discipline – political science, international relations, Middle East studies, sociology, psychology, criminology, economics, computers, law, biology, chemistry, physics, etc. Thus, working on the problems related to coping with terrorism requires a perspective and an analytical ability that are as broad as possible. The academic world must therefore undertake to help all those who are occupied with thwarting terrorist attacks, by providing analytic thinking tools and data relevant to the war on terrorism. In this framework, a forum of international academic research which assembles the best academic minds for research activities must be established. The forum will direct the researchers to research questions that are especially relevant to the entities thwarting terrorism, will provide the researchers with necessary financial resources, will arrange introductory meetings and divide tasks between different researchers from all over the world, and will help build a joint academic database. In order to win over the necessary international public opinion in the counterterrorism struggle, joint public relations and resilience activities are needed for the countries coping with this phenomenon, as well as for other countries. To that end, it is necessary to set up an international framework of experts who can formulate joint public relations and resilience policies, and who will work with the educational systems in the different countries. The establishment of such a framework should be given top priority in order to provide assistance to the public relations and education systems in Muslim countries, as part of coping with the radical Islamist indoctrination in those countries. The international teams will offer the Muslim countries any required assistance in developing curriculums, and in receiving grants and other forms of financial assistance for educational activities promoting tolerance, pragmatism, and the spread of liberal- democratic values. An international mechanism is required to enable the exchange of current information, as an international data base will make it easier for scientists to overcome various technological problems. This framework will determine the international goals and needs in the field of technological counterterrorism; will set up joint think tank and development teams while focusing on the fields that each country has the relative upper hand in; will establish international research funds that will be devoted to financing and promoting technological developments in this field; will enable scientists to use laboratories, computers, and special means of development possessed by the participating countries – all in an effort to find new technologies for fighting terrorism. 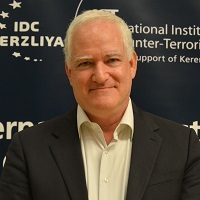 In order to implement effective strategy against terrorist organizations and against the countries that support them, it is necessary to transfer to a permanent international institution for counterterrorism the authority to define the countries and organizations involved in terrorism, and to decide what sanctions and actions will be taken against them. In this institution, which will operate according to the accepted international agreement and definition of terrorism, the experts from different nations will study the involvement of different countries in aiding terrorism. According to their findings, every year a list of countries involved in terrorism will be published. International steps will then be taken against those countries appearing on the list, in accordance with their level of support to terrorism, in order to force them to cease their involvement in terrorism, or at least to decrease it. It is plausible to assume that such a comprehensive international process in this field will be doomed to failure, due to the conflicting interests of different countries. But it may also be that it is possible to implement some of the goals by establishing a League of Nations Fighting Terrorism with the participation of several countries that suffer from or are concerned about terrorism, and afterward additional nations can be brought into the framework. Theoretically, the United Nations is supposed to fulfill this role. However, it seems that this organization is not able to set an efficient plan of action into motion, against international terrorism in general, and certainly not against specific member states involved in terrorism. Only by adopting all of the steps mentioned above, and by combining them in the local and global struggles against terrorism and its instigators, might it be possible to upgrade international cooperation and to transform it into a joint and effective campaign against jihadist terrorism. Creating this League of Nations Fighting Terrorism is necessary since only a network of countries fighting terrorism will be able to overcome the global terrorism network.